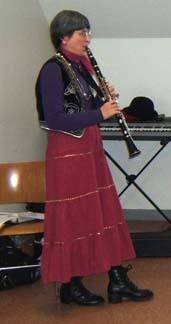 This concert was the final event in the KlezmerShack's 10th Anniversary concert series. To read notes and coverage about the series, see the 10th Anniversary archive page and calendar listings. Other coverage of the concert is by Nancy Metashvili and Ari Davidow. Visit the concert photo gallery on Flickr (tag: bjmf2006), or the ivritype photo gallery. This was originally posted to the Jewish-Music mailing list on 2006-Mar-26. Posted here with the author's permission. Being truant in my reading of this list, I would nevertheless like to offer some congrats. Since Ari Davidow was a prime mover re. this one, would like to thank him for his invaluable hard work (the concerts were a culmination of celebrating the 10th anniversary of Ari's Klezmershack.com), and "gibn Hankus Netsky un di gantze kapelye op a hartzikn yasher koyakh" (it just feels right to congratulate people who play Yiddish music in Yiddish!). These two concerts, which were performed today and last night at the Newton, MA, JCC, were actually several concerts in one. ... guest singer Michael Alpert singing stuff like "Rumania" and a very moving "Vilne"—to this listener, kind of a weird juxtaposition both for him, and the band, respectively, but it worked, anyway! ... don't want to forget Marvin Weinberger who played an understated but excellent fiddle—and helped set up the KCB Foundation (which preserves old music and subsidizes concerts for elders) in his capacity as lawyer. ... last but not least, the inimitable Hankus Netsky, playing his amazing piano—masterfully accompanying every style of Yiddish music there is (but I still don't know how he gets away with throwing in tons of 7th chords accompanying a doyne. But he does). On Sunday there were 7 well-attended workshops: dance, lead by Alpert, two klezmer workshops taught by KCB's original accordionist Barry Shapiro, and by Hankus, a fidl kapelye led by Deborah, a Taste of Yiddish with the Workmen's Circle's popular Dovid Braun, and a Round Table re. "what's next" with the klezmer revival. In the latter, there was discussion of how Yiddish music is marginalized: Hankus pointed out that there is not one book on Yiddish popular music after 1924 (Mark Slobin having covered the pre-'24 in his "Tenement Songs") ... Jeff W. mentioned that at the CAGE (Conference on Alternatives in Jewish Education [?]) that klezmer music was ghettoized in a far away room way and late at night ... Deborah pointed out that the "traditional" label isn't useful: her version is different than Michael's, for example. Rather, the dichotomy is mainstream vs. offstream. Several people noted that it is a challenge re. how to get Yiddish music into Jewish studies ciriculum; Jeff noted how at a concert of khazns at an unnamed institution, the knowledge of Yiddish music presented by the students was limited, and Hankus noted that altho' Florida Atlantic University has a Yiddish music archive, they don't have any Yiddish speakers who can catalogue their holdings! There was also a discussion of how Jews, per Alpert, are "Judeo versions of their neighbors" so that Matisyahu and Debbie Friedman (oy, I probably spelled both of their names wrong! ), who use Jewish ideas and texts utilize the vocabulary of (non-Jewish) music prevalent in the U.S. (dub/reggae & folk respectively), but not traditional Jewish music. Also it was also noted that one stream of Yiddish music is alive and well in Hasidic communities and available to Jews outside of those communities; there is sometimes a mutual curiosity from both worlds re. the others', too. So, I'm not sure if the question posited by the workshop title was answered (as if it could be in an hour!) but it sure was interesting hearing what the panelists had to say! At any rate, a fun time was had by all, from little kids of 6 or so who told me that yes, they liked the music, to an 80-something who heard the KCB at their first concert. Here's to the next 26 years of KCB and the superb musicians who made it happen! L'khayem! Copyright © 2006 Dena Ressler. All rights reserved. Used with Permission. This page is maintained by Ari Davidow. Send me E-mail with any comments or suggestions. All rights reserved. Last revised 02 September, 2013.